Judging by the model of Hillman car in the wash bay, these photographs were taken some time just before, or just after, WWII. I served my apprenticeship here between 1966-1971. It would be interesting to know if anyone has any other photographs of Vine and Lee of 19-22 Station Road Portslade. If you remember the company, or can share any memories with us, please leave a comment below. I worked for Vine and Lee in the 70s as a general dogsbody serving petrol, cleaning cars, etc etc. They were a nice friendly firm to work for. You had to swing the petrol pump lines out across the pavement to the kerb in order to fill the car’s tank, with everyone walking up and down smoking – it would never be allowed now! Still have a key fob somewhere. Ken, I think I may remember you. I need time to remember. I worked in the office with Mr. Cousins, Jean, Joan O’Connor, Joan Postins, and Susan Gander in 1969. Do you remember any of them? At the moment I can’t remember the names of the boys in the garage. It was a very friendly place to work and we had much fun. Best Wishes, Madeleine Goacher. Hi Mimi ! I received your email and have just read your comment as to the names of the other lads in the workshop: Jim Foster, workshop manager; John Player, assistant manager; Cecil Peters, workshop foreman; George Greenfield, senior mechanic; Les (toto) Goatcher, apprentice; Chris Howard, apprentice; Phil Way, apprentice; Graham Seabrook, apprentice; Greg Doull, apprentice; Ray Way, mechanic; Ken Dawes, mechanic; Les Hastings, body shop; Stan Cotteral, wash bay and fuel pumps and Eric Lilly, mechanic! 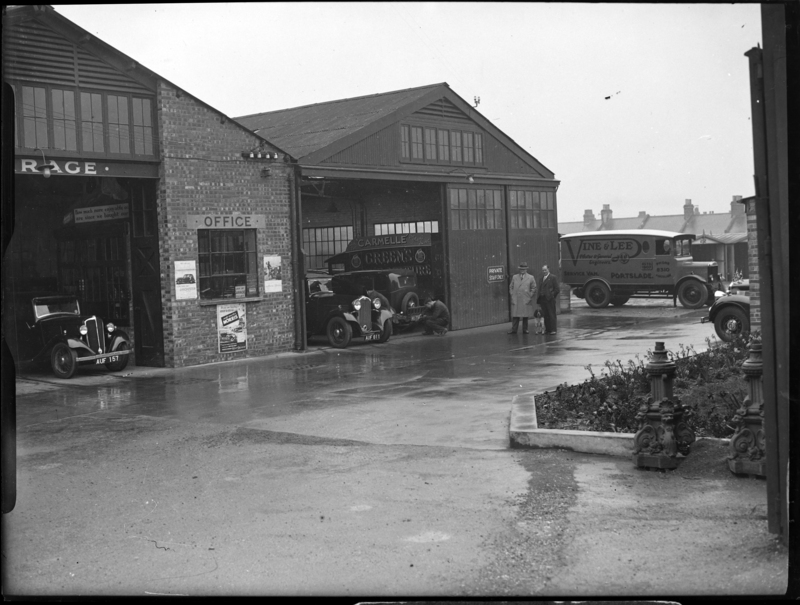 There are a few more people I can see their faces in my mind but cannot put names to them – when I can, I will add them to the list, regards Ken B.
Hi Ken, I believe these photos might be of my great-grandfather’s garage. My Grandfather’s name was Peter Lee (his daughter was Denise Lee). My Grandmother is Grace Lee and she’s currently trying to write up some family history and I’d be incredibly grateful for any information anyone could give me about Vine & Lee, any photos or memories that might help my gran in her research. I just found the site and read about Vine and Lee’s. It was owned by my uncle Ken Lee. Where exactly was Vine and Lee located? I must have walked past many times. Was it south from the railway crossing, in Station Road which I think was on the left? Or was it north up towards Old Shoreham Road, also on the left? I spent many years away in the RAF plus other overseas jobs . I do remember Merritts ,the butcher, the Post Office and a solicitors office that everyone warned me against, on the other side of Boundary Road. Vine & Lee’s showrooms were exactly where the Tesco store in Station Road now stands. Hi Barry, it was approximately halfway between Vale Road and Franklin Road on the right hand side. 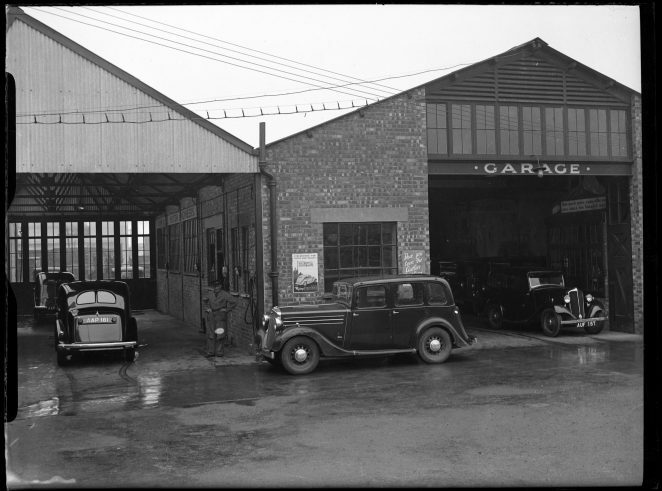 It had the garage showroom as a frontage, but you had to walk/drive up a little approach road and enter a biggish yard with the actual garage facilities.